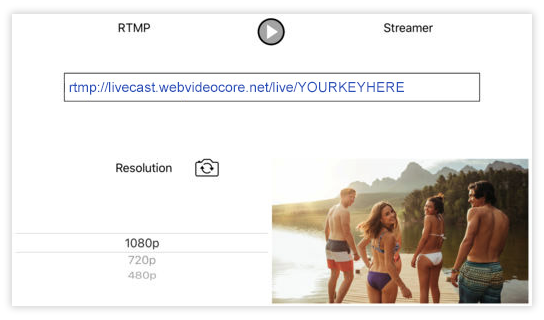 In this article you will learn how to Live Stream to your Live Player using RTMP STREAMER and a Apple iOS Device. If you want to check out some Live Streaming Demos and extra information please visit our Live Streaming information page. Now select the 🎥 Live Studio button in the top media view. This will open the Live Studio in a Popup window. When starting RTMP Streamer for the first time you will be presented with two access requested. The first request is to give RTMP Streamer access to the devices camera: Click on Allow. The second is to give RTMP Streamer access to the devices microphone: Click on Allow. With both Access requests granted, you will be presented with the RTMP Streamer interface. Click on the Settings Cog ⚙️ located in the bottom left corner. In the RTMP Streamer configuration enter the RTMP URL and Stream Key from your Broadcast Panel separated by a forward slash ”/“. With the RTMP details entered click on the bottom right video feed image which will take you back to the RTMP Streamer Window. Now simply press the Red 🔴 round Stream Button at the bottom of the application to start streaming. Back in the 🎥 Live Studio you are able to see the incoming stream in the Local Preview Window. When you are ready to transmit the feed to your viewers, simply click on the Start Broadcast button. The feeds now visible by your audience in the Live Player. When you want to stop the stream you can either stop it from RTMP Streamer by clicking on the Red Stream Button 🔴 which will keep the Live Player ready to steam as soon as you click on the Red Stream Button 🔴 button in RTMP Streamer. Or you stop the broadcast from our 🎥 Live Studio by pressing the Stop Broadcast button beneath the Local Preview window. This will require you to re-start the broadcast from the 🎥 Live Studio next time we do a live stream.